This article is about the novel. For the film, TV and opera adaptations, see The Great Gatsby (disambiguation). The Great Gatsby is a 1925 novel written by American author F. Scott Fitzgerald that follows a cast of characters living in the fictional town of West Egg on prosperous Long Island in the summer of 1922. The story primarily concerns the young and mysterious millionaire Jay Gatsby and his quixotic passion and obsession for the beautiful former debutante Daisy Buchanan. Considered to be Fitzgerald's magnum opus, The Great Gatsby explores themes of decadence, idealism, resistance to change, social upheaval, and excess, creating a portrait of the Jazz Age or the Roaring Twenties that has been described as a cautionary tale regarding the American Dream. Fitzgerald—inspired by the parties he had attended while visiting Long Island's north shore—began planning the novel in 1923, desiring to produce, in his words, "something new—something extraordinary and beautiful and simple and intricately patterned." Progress was slow, with Fitzgerald completing his first draft following a move to the French Riviera in 1924. His editor, Maxwell Perkins, felt the book was vague and persuaded the author to revise over the next winter. Fitzgerald was repeatedly ambivalent about the book's title and he considered a variety of alternatives, including titles that referenced the Roman character Trimalchio; the title he was last documented to have desired was Under the Red, White, and Blue." First published by Scribner's in April 1925, The Great Gatsby received mixed reviews and sold poorly; in its first year, the book sold only 20,000 copies. Fitzgerald died in 1940, believing himself to be a failure and his work forgotten. However, the novel experienced a revival during World War II, and became a part of American high school curricula and numerous stage and film adaptations in the following decades. Today, The Great Gatsby is widely considered to be a literary classic and a contender for the title "Great American Novel." In 1998, the Modern Library editorial board voted it the 20th century's best American novel and second best English-language novel of the same time period. Set on the prosperous Long Island of 1922, The Great Gatsby provides a critical social history of America during the Roaring Twenties within its fictional narrative. That era, known for unprecedented economic prosperity, the evolution of jazz music, flapper culture, new technologies in communication (motion pictures, broadcast radio, recorded music) forging a genuine mass culture; and bootlegging, along with other criminal activity, is plausibly depicted in Fitzgerald's novel. Fitzgerald uses these societal developments of the 1920s to build Gatsby's stories from simple details like automobiles to broader themes like Fitzgerald's discreet allusions to the organized crime culture which was the source of Gatsby's fortune. Fitzgerald educates his readers about the garish society of the Roaring Twenties by placing a timeless, relatable plotline within the historical context of the era. Fitzgerald's visits to Long Island's north shore and his experience attending parties at mansions inspired The Great Gatsby's setting. Today, there are a number of theories as to which mansion was the inspiration for the book. One possibility is Land's End, a notable Gold Coast Mansion where Fitzgerald may have attended a party. Many of the events in Fitzgerald's early life are reflected throughout The Great Gatsby. Fitzgerald was a young man from Minnesota, and like Nick, he was educated at an Ivy League school, Princeton (in Nick's case, Yale). Fitzgerald is also similar to Jay Gatsby, in that he fell in love while stationed far from home in the military and fell into a life of decadence trying to prove himself to the girl he loved. Fitzgerald became a second lieutenant, and was stationed at Camp Sheridan, in Montgomery, Alabama. There he met and fell in love with a wild seventeen-year-old beauty named Zelda Sayre. Zelda finally agreed to marry him, but her preference for wealth, fun, and leisure led her to delay their wedding until he could prove a success. Like Nick in The Great Gatsby, Fitzgerald found this new lifestyle seductive and exciting, and, like Gatsby, he had always idolized the very rich. In many ways, The Great Gatsby represents Fitzgerald's attempt to confront his conflicting feelings about the Jazz Age. Like Gatsby, Fitzgerald was driven by his love for a woman who symbolized everything he wanted, even as she led him toward everything he despised. In her book Careless People: Murder, Mayhem and the Invention of 'The Great Gatsby (2013), Sarah Churchwell speculates that parts of the ending of The Great Gatsby were based on the Hall-Mills Case. Based on her forensic search for clues, she asserts that the two victims in the Hall-Mills murder case inspired the characters who were murdered in The Great Gatsby. The main events of the novel take place in the summer of 1922. Nick Carraway, a Yale graduate and veteran of the Great War from the Midwest—who serves as the novel's narrator—takes a job in New York as a bond salesman. He rents a small house on Long Island, in the fictional village of West Egg, next door to the lavish mansion of Jay Gatsby, a mysterious millionaire who holds extravagant parties but does not participate in them. Nick drives around the bay to East Egg for dinner at the home of his cousin, Daisy Fay Buchanan, and her husband, Tom, a college acquaintance of Nick's. They introduce Nick to Jordan Baker, an attractive, cynical young golfer with whom Nick begins a romantic relationship. She reveals to Nick that Tom has a mistress, Myrtle Wilson, who lives in the "valley of ashes", an industrial dumping ground between West Egg and New York City. Not long after this revelation, Nick travels to New York City with Tom and Myrtle to an apartment Tom keeps for his affairs with Myrtle and others. At Tom's New York apartment, a vulgar and bizarre party takes place. It ends with Tom breaking Myrtle's nose after she annoys him by saying Daisy's name several times. As the summer progresses, Nick eventually receives an invitation to one of Gatsby's parties. Nick encounters Jordan Baker at the party, and they meet Gatsby himself, an aloof and surprisingly young man who recognizes Nick from their same division in the Great War. Through Jordan, Nick later learns that Gatsby knew Daisy through a purely chance meeting in 1917, when Daisy and her friends were doing volunteer services' work with young Officers headed to Europe. From their brief meetings and casual encounters at that time, Gatsby became (and still is) deeply in love with Daisy. And even more, he became obsessed with the idea of her, and the ideal of living in the world he saw her living in, as the fulfillment of all the possible dreams he could ever have. Gatsby spends many nights staring at the green light at the end of Tom and Daisy's dock, across the bay from his mansion, hoping one day to rekindle their lost romance. Jordan confides in Nick that the only reason he bought the mansion is that it was across the bay from Tom and Daisy's home. And Gatsby's extravagant lifestyle and wild parties were an attempt to impress Daisy and raise her curiosity about her "anonymous" neighbor across the bay. Gatsby had hoped that one day curiosity would have brought the unsuspecting Daisy to appear at his doorstep, and thereby he'd be able to present himself as a "new man", now of wealth and position, and now able to join her at her side and within her world. That however never played out, and although Tom had been invited (as a guest of Jordan's) to a Gatsby party and had attended more than one of them, both he and Daisy had (for different reasons) never responded affirmatively to an RSVP to attend as the Buchanans (Mr. and Mrs.). The deeper reasons behind this fact are expanded upon later in the story by Daisy. His research of Nick, who has so fortuitously rented the small cottage next door to Gatsby's mansion, results in a wholly new approach to his problem of how to introduce Daisy to the "new" J. Gatsby. The whole purpose of the "invitation" to Nick to attend a Gatsby party was to develop a relationship with him so that Gatsby could later ask Nick to arrange a reunion between himself and Daisy. Nick invites Daisy to have tea at his house without telling her that Gatsby will also be there. After an initially awkward reunion, Gatsby and Daisy reestablish their connection. They begin an affair and, after a short time, Tom grows increasingly suspicious of his wife's relationship with Gatsby. At a luncheon at the Buchanans' house, Daisy speaks to Gatsby with such undisguised intimacy that Tom realizes she is in love with Gatsby. Though Tom is himself involved in an extramarital affair, he is outraged by his wife's infidelity. 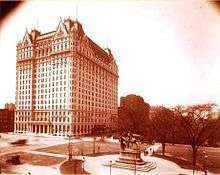 He forces the group to drive into New York City and confronts Gatsby in a suite at the Plaza Hotel, asserting that he and Daisy have a history that Gatsby could never understand. In addition to that, he announces to his wife that Gatsby is a criminal whose fortune comes from bootlegging alcohol and other illegal activities. Daisy realizes that her allegiance is to Tom, and Tom contemptuously sends her back to East Egg with Gatsby, attempting to prove that Gatsby cannot hurt him. When Nick, Jordan, and Tom drive through the valley of ashes on their way home, they discover that Gatsby's car has struck and killed Tom's mistress, Myrtle. Nick later learns from Gatsby that Daisy, not Gatsby himself, was driving the car at the time of the accident but Gatsby intends to take the blame anyway. Myrtle's husband, George, falsely concludes that the driver of the yellow car is the secret lover he recently began suspecting she has, and sets out on foot to locate its owner. After finding out the yellow car is Gatsby's, he arrives at Gatsby's mansion where he fatally shoots Gatsby and then himself. Nick stages an unsettlingly small funeral for Gatsby, ends his relationship with Jordan, and moves back to the Midwest, disillusioned with the Eastern lifestyle. Nick Carraway – a Yale graduate originating from the Midwest, a World War I veteran, and, at the start of the plot, a newly arrived resident of West Egg, who is aged 29 (later 30). He also serves as the first-person narrator of the novel. He is Gatsby's next-door neighbor and a bond salesman. He is easy-going, occasionally sarcastic, and somewhat optimistic, although this latter quality fades as the novel progresses. Jay Gatsby (originally James "Jimmy" Gatz) – a young, mysterious millionaire with shady business connections (later revealed to be a bootlegger), originally from North Dakota. He is obsessed with Daisy Buchanan, a beautiful debutante from Louisville, Kentucky whom he had met when he was a young military officer stationed at the Army's Camp Taylor in Louisville during World War I. Fitzgerald himself was actually based at Camp Taylor in Louisville when he was in the Army and makes various references to Louisville in the novel, including the Seelbach Hotel where the Buchanan party stayed while in town for Tom and Daisy's wedding. The character is based on the bootlegger and former World War I officer, Max Gerlach, according to Some Sort of Epic Grandeur, Matthew J. Bruccoli's biography of F. Scott Fitzgerald. Gatsby is said to have briefly studied at Trinity College, Oxford in England after the end of World War I.
Daisy Fay Buchanan – an attractive and effervescent, if shallow and self-absorbed, young Louisville, Kentucky debutante and socialite, identified as a flapper. She is Nick's second cousin, once removed, and the wife of Tom Buchanan. Daisy is believed to have been inspired by Fitzgerald's own youthful romances with Ginevra King. Daisy once had a romantic relationship with Gatsby, before she married Tom. Her choice between Gatsby and Tom is one of the central conflicts in the novel. Thomas "Tom" Buchanan – a millionaire who lives on East Egg, and Daisy's husband. Tom is an imposing man of muscular build with a "husky tenor" voice and arrogant demeanor. He is a former football star at Yale. Buchanan has parallels with William Mitchell, the Chicagoan who married Ginevra King. Buchanan and Mitchell were both Chicagoans with an interest in polo. Like Ginevra's father, whom Fitzgerald resented, Buchanan attended Yale and is a white supremacist. Jordan Baker – Daisy Buchanan's long-time friend with "autumn-leaf yellow" hair, a firm athletic body, and an aloof attitude. She is Nick Carraway's girlfriend for most of the novel and an amateur golfer with a slightly shady reputation and a penchant for untruthfulness. Fitzgerald told Maxwell Perkins that Jordan was based on the golfer Edith Cummings, a friend of Ginevra King. Her name is a play on the two popular automobile brands, the Jordan Motor Car Company and the Baker Motor Vehicle, alluding to Jordan's "fast" reputation and the freedom now presented to Americans, especially women, in the 1920s. George B. Wilson – a mechanic and owner of a garage. He is disliked by both his wife, Myrtle Wilson, and Tom Buchanan, who describes him as "so dumb he doesn't know he's alive". When he learns of the death of his wife, he shoots and kills Gatsby, wrongly believing he had been driving the car that killed Myrtle, and then kills himself. Myrtle Wilson – George's wife, and Tom Buchanan's mistress. Myrtle, who possesses a fierce vitality, is desperate to find refuge from her complacent marriage, but unfortunately this leads to her tragic ending. She is accidentally killed by Gatsby's car (driven by Daisy, though Gatsby insists he would take the blame for the accident). Meyer Wolfshiem[note 1] – a Jewish friend and mentor of Gatsby's, described as a gambler who fixed the World Series. Wolfshiem appears only twice in the novel, the second time refusing to attend Gatsby's funeral. He is a clear allusion to Arnold Rothstein, a New York crime kingpin who was notoriously blamed for the Black Sox Scandal which tainted the 1919 World Series. Fitzgerald began planning his third novel in June 1922, but it was interrupted by production of his play, The Vegetable, in the summer and fall. The play failed miserably, and Fitzgerald worked that winter on magazine stories struggling to pay his debt caused by the production. The stories were, in his words, "all trash and it nearly broke my heart," although included among those stories was "Winter Dreams", which Fitzgerald later described as "a sort of first draft of the Gatsby idea". After the birth of their child, the Fitzgeralds moved to Great Neck, New York, on Long Island, in October 1922. The town was used as the scene of The Great Gatsby. Fitzgerald's neighbors in Great Neck included such prominent and newly wealthy New Yorkers as writer Ring Lardner, actor Lew Fields, and comedian Ed Wynn. These figures were all considered to be "new money", unlike those who came from Manhasset Neck or Cow Neck Peninsula, places which were home to many of New York's wealthiest established families, and which sat across the bay from Great Neck. This real-life juxtaposition gave Fitzgerald his idea for "West Egg" and "East Egg". In this novel, Great Neck (King's Point) became the "new money" peninsula of West Egg and Port Washington (Sands Point) the old-money East Egg. 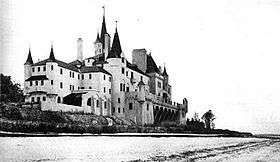 Several mansions in the area served as inspiration for Gatsby's home, such as Oheka Castle and Beacon Towers, since demolished. By mid-1923, Fitzgerald had written 18,000 words for his novel but discarded most of his new story as a false start, some of which resurfaced in the 1924 short story "Absolution". Work on The Great Gatsby began in earnest in April 1924. Fitzgerald wrote in his ledger, "Out of woods at last and starting novel." He decided to make a departure from the writing process of his previous novels and told Perkins that the novel was to be a "consciously artistic achievement" and a "purely creative work—not trashy imaginings as in my stories but the sustained imagination of a sincere and yet radiant world." He added later, during editing, that he felt "an enormous power in me now, more than I've ever had." Soon after this burst of inspiration, work slowed while the Fitzgeralds made a move to the French Riviera, where a serious crisis in their relationship soon developed. By August, however, Fitzgerald was hard at work and completed what he believed to be his final manuscript in October, sending the book to his editor, Maxwell Perkins, and agent, Harold Ober, on October 30. The Fitzgeralds then moved to Rome for the winter. Fitzgerald made revisions through the winter after Perkins informed him in a November letter that the character of Gatsby was "somewhat vague" and Gatsby's wealth and business, respectively, needed "the suggestion of an explanation" and should be "adumbrated". Content after a few rounds of revision, Fitzgerald returned the final batch of revised galleys in the middle of February 1925. Fitzgerald's revisions included an extensive rewriting of Chapter VI and VIII. Despite this, he refused an offer of $10,000 for the serial rights in order not to delay the book's publication. He had received a $3,939 advance in 1923 and $1,981.25 upon publication. 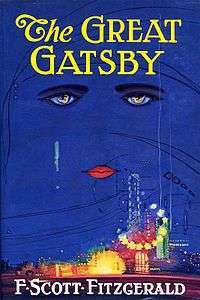 The cover of the first printing of The Great Gatsby is among the most celebrated pieces of art in American literature. It depicts disembodied eyes and a mouth over a blue skyline, with images of naked women reflected in the irises. A little-known artist named Francis Cugat was commissioned to illustrate the book while Fitzgerald was in the midst of writing it. The cover was completed before the novel; Fitzgerald was so enamored with it that he told his publisher he had "written it into" the novel. Fitzgerald's remarks about incorporating the painting into the novel led to the interpretation that the eyes are reminiscent of those of fictional optometrist Dr. T. J. Eckleburg (depicted on a faded commercial billboard near George Wilson's auto repair shop) which Fitzgerald described as "blue and gigantic – their retinas[note 2] are one yard high. They look out of no face, but instead, from a pair of enormous yellow spectacles which pass over a non-existent nose." Although this passage has some resemblance to the painting, a closer explanation can be found in the description of Daisy Buchanan as the "girl whose disembodied face floated along the dark cornices and blinding signs." Ernest Hemingway wrote in A Moveable Feast that when Fitzgerald lent him a copy of The Great Gatsby to read, he immediately disliked the cover, but "Scott told me not to be put off by it, that it had to do with a billboard along a highway in Long Island that was important in the story. He said he had liked the jacket and now he didn't like it." Fitzgerald had difficulty choosing a title for his novel and entertained many choices before reluctantly choosing The Great Gatsby, a title inspired by Alain-Fournier's Le Grand Meaulnes. Prior, Fitzgerald shifted between Gatsby; Among Ash-Heaps and Millionaires; Trimalchio; Trimalchio in West Egg; On the Road to West Egg; Under the Red, White, and Blue; Gold-Hatted Gatsby; and The High-Bouncing Lover. He initially preferred titles referencing Trimalchio, the crude parvenu in Petronius's Satyricon, and even refers to Gatsby as Trimalchio once in the novel: "It was when curiosity about Gatsby was at its highest that the lights in his house failed to go on one Saturday night—and, as obscurely as it had begun, his career as Trimalchio was over." Unlike Gatsby's spectacular parties, Trimalchio participated in the audacious and libidinous orgies he hosted but, according to Tony Tanner's introduction to the Penguin edition, there are subtle similarities between the two. In November 1924, Fitzgerald wrote to Perkins that "I have now decided to stick to the title I put on the book ... Trimalchio in West Egg" but was eventually persuaded that the reference was too obscure and that people would not be able to pronounce it. His wife, Zelda, and Perkins both expressed their preference for The Great Gatsby and the next month Fitzgerald agreed. A month before publication, after a final review of the proofs, he asked if it would be possible to re-title it Trimalchio or Gold-Hatted Gatsby but Perkins advised against it. On March 19, 1925, Fitzgerald expressed intense enthusiasm for the title Under the Red, White and Blue, but it was at that stage too late to change. The Great Gatsby was published on April 10, 1925. Fitzgerald remarked that "the title is only fair, rather bad than good." Early drafts of the novel entitled Trimalchio: An Early Version of The Great Gatsby have been published. A notable difference between the Trimalchio draft and The Great Gatsby is a less complete failure of Gatsby's dream in Trimalchio. Another difference is that the argument between Tom Buchanan and Jay Gatsby is more even, although Daisy still returns to Tom. Sarah Churchwell sees The Great Gatsby as a "cautionary tale of the decadent downside of the American dream." The story deals with the limits and realities of America's myths of social and class mobility; and the inevitably hopeless lower class aspirations to rise above the station(s) of their birth. The book in stark relief through the narrator, Nick Caraway, observes that: "...a sense of the fundamental decencies is parcelled out unequally at birth." Using elements of irony and tragic ending, it also delves into themes of excesses of the rich, and recklessness of youth. Others, like journalist Nick Gillespie, see The Great Gatsby as a story "underlying permanence of class differences; even in the face of a modern economy's attempt to assert that the class structure is based; not on status and inherited position; but, upon the innovation and the ability of literally anyone, to succeed by meeting the ever-changing demands and tastes of consumers' needs." This interpretation asserts that The Great Gatsby captures the American experience because it is a story about change and those who resist it; whether the change comes in the form of a new wave of immigrants (Southern Europeans in the early 20th century, Latin Americans today), the nouveau riche, or successful minorities, Americans from the 1920s to modern day have plenty of experience with changing economic and social circumstances. As Gillespie states, "While the specific terms of the equation are always changing, it's easy to see echoes of Gatsby's basic conflict between established sources of economic and cultural power and upstarts in virtually all aspects of American society." Because this concept is particularly American and can be seen throughout American history, readers are able to relate to The Great Gatsby (which has lent the novel an enduring popularity). Later critical writings on The Great Gatsby, following the novel's revival, focus in particular on Fitzgerald's disillusionment with the American Dream — life, liberty and the pursuit of happiness – in the context of the hedonistic Jazz Age, a name for the era which Fitzgerald claimed to have coined. In 1970, Roger Pearson published the article Gatsby: False prophet of the American Dream, in which he states that Fitzgerald "has come to be associated with this concept of the AMERICAN Dream more than any other writer of the twentieth century". Pearson goes on to suggest that Gatsby's failure to realize the American dream demonstrates that it no longer exists except in the minds of those as materialistic as Gatsby. He concludes that the American dream pursued by Gatsby "is, in reality, a nightmare", bringing nothing but discontent and disillusionment to those who chase it as they realize its unsustainability and ultimately its unattainability. In addition to exploring the trials and tribulations of achieving the great American dream during the Jazz Age, The Great Gatsby explores societal gender expectations as a theme, exemplifying in Daisy Buchanan's character the marginalization of women in the East Egg social class that Fitzgerald depicts. As an upper-class, white woman living in East Egg during this time period in America, Daisy must adhere to certain societal expectations, including but certainly not limited to actively filling the role of dutiful wife, mother, keeper of the house, and charming socialite. As the reader finds in the novel, many of Daisy's choices, ultimately culminating in the tragedy of the plot and misery for all those involved, can be at least partly attributed to her prescribed role as a "beautiful little fool" who is completely reliant on her husband for financial and societal security. For instance, one could argue that Daisy's ultimate decision to remain with her husband despite her feelings for Gatsby can be attributed to the status, security, and comfort that her marriage to Tom Buchanan provides. Additionally, the theme of the female familial role within The Great Gatsby goes hand in hand with that of the ideal family unit associated with the great American dream- a dream that goes unrealized for Gatsby and Daisy in Fitzgerald's prose. The Great Gatsby was published by Charles Scribner's Sons on April 10, 1925. Fitzgerald called Perkins on the day of publication to monitor reviews: "Any news?" "Sales situation doubtful," read a wire from Perkins on April 20, "[but] excellent reviews." Fitzgerald responded on April 24, saying the cable "depressed" him, closing the letter with "Yours in great depression." Fitzgerald had hoped the novel would be a great commercial success, perhaps selling as many as 75,000 copies. By October, when the original sale had run its course, the book had sold fewer than 20,000 copies. Despite this, Scribner's continually kept the book in print; they carried the original edition on their trade list until 1946, by which time Gatsby was in print in three other forms and the original edition was no longer needed. Fitzgerald received letters of praise from contemporaries T. S. Eliot, Edith Wharton, and Willa Cather regarding the novel; however, this was private opinion, and Fitzgerald feverishly demanded the public recognition of reviewers and readers. The Great Gatsby received mixed reviews from literary critics of the day. Generally the most effusive of the positive reviews was Edwin Clark of The New York Times, who felt the novel was "A curious book, a mystical, glamourous story of today." Similarly, Lillian C. Ford of the Los Angeles Times wrote, "[the novel] leaves the reader in a mood of chastened wonder," calling the book "a revelation of life" and "a work of art." The New York Post called the book "fascinating ... His style fairly scintillates, and with a genuine brilliance; he writes surely and soundly." The New York Herald Tribune was unimpressed, but referred to The Great Gatsby as "purely ephemeral phenomenon, but it contains some of the nicest little touches of contemporary observation you could imagine-so light, so delicate, so sharp .... a literary lemon meringue." In The Chicago Daily Tribune, H.L. Mencken called the book "in form no more than a glorified anecdote, and not too probable at that," while praising the book's "careful and brilliant finish." Several writers felt that the novel left much to be desired following Fitzgerald's previous works and promptly criticized him. Harvey Eagleton of The Dallas Morning News believed the novel signaled the end of Fitzgerald's success: "One finishes Great Gatsby with a feeling of regret, not for the fate of the people in the book, but for Mr. Fitzgerald." John McClure of The Times-Picayune said that the book was unconvincing, writing, "Even in conception and construction, The Great Gatsby seems a little raw." Ralph Coghlan of the St. Louis Post-Dispatch felt the book lacked what made Fitzgerald's earlier novels endearing and called the book "a minor performance ... At the moment, its author seems a bit bored and tired and cynical." Ruth Snyder of New York Evening World called the book's style "painfully forced", noting that the editors of the paper were "quite convinced after reading The Great Gatsby that Mr. Fitzgerald is not one of the great American writers of to-day." The reviews struck Fitzgerald as completely missing the point: "All the reviews, even the most enthusiastic, not one had the slightest idea what the book was about." Fitzgerald's goal was to produce a literary work which would truly prove himself as a writer, and Gatsby did not have the commercial success of his two previous novels, This Side of Paradise and The Beautiful and Damned. Although the novel went through two initial printings, some of these copies remained unsold years later. Fitzgerald himself blamed poor sales on the fact that women tended to be the main audience for novels during this time, and Gatsby did not contain an admirable female character. According to his own ledger, now made available online by University of South Carolina's Thomas Cooper library, he earned only $2,000 from the book. Although 1926 brought Owen Davis's stage adaption and the Paramount-issued silent film version, both of which brought in money for the author, Fitzgerald still felt the novel fell short of the recognition he hoped for and, most importantly, would not propel him to becoming a serious novelist in the public eye. For several years afterward, the general public believed The Great Gatsby to be nothing more than a nostalgic period piece. In 1940, Fitzgerald suffered a third and final heart attack, and died believing his work forgotten. His obituary in The New York Times mentioned Gatsby as evidence of great potential that was never reached. However, a strong appreciation for the book had developed in underground circles; future writers Edward Newhouse and Budd Schulberg were deeply affected by it and John O'Hara showed the book's influence. The republication of Gatsby in Edmund Wilson's edition of The Last Tycoon in 1941 produced an outburst of comment, with the general consensus expressing the sentiment that the book was an enduring work of fiction. In 1942, a group of publishing executives created the Council on Books in Wartime. The Council's purpose was to distribute paperback books to soldiers fighting in the Second World War. The Great Gatsby was one of these books. The books proved to be "as popular as pin-up girls" among the soldiers, according to the Saturday Evening Post's contemporary report. 155,000 copies of Gatsby were distributed to soldiers overseas, and it is believed that this publicity ultimately boosted the novel's popularity and sales. By 1944, full-length articles on Fitzgerald's works were being published, and the following year, "the opinion that Gatsby was merely a period piece had almost entirely disappeared." This revival was paved by interest shown by literary critic Edmund Wilson, who was Fitzgerald's friend. In 1951, Arthur Mizener published The Far Side of Paradise, a biography of Fitzgerald. He emphasized The Great Gatsby's positive reception by literary critics, which may have influenced public opinion and renewed interest in it. By 1960, the book was steadily selling 50,000 copies per year, and renewed interest led The New York Times editorialist Arthur Mizener to proclaim the novel "a classic of twentieth-century American fiction". The Great Gatsby has sold over 25 million copies worldwide as of 2013, annually sells an additional 500,000 copies, and is Scribner's most popular title; in 2013, the e-book alone sold 185,000 copies. Scribner's copyright is scheduled to expire in 2020, according to Maureen Corrigan's book about the making of The Great Gatsby, So We Read On. In 2009, BalletMet premiered a version at the Capitol Theatre in Columbus, Ohio. It was choreographed by Jimmy Orrante. In 2010, The Washington Ballet premiered a version at the Kennedy Center. It was popularly demanded for an encore run the following year. In 2013, the Northern Ballet premiered a version of The Great Gatsby at Leeds Grand Theatre in the UK, with choreography and direction by David Nixon, a musical score by Richard Rodney Bennett, and set designs by Jerome Kaplan. Nixon also created the scenario and costumes designs. In 2010, Oberon Media released a casual hidden object game called Classic Adventures: The Great Gatsby. The game was released for iPad in 2012. In 2011, as a tribute to old NES games, developer Charlie Hoey and editor Pete Smith created an 8-bit-style online game of The Great Gatsby. Ian Crouch of The New Yorker compared it to The Adventures of Tom Sawyer (1989) for the NES. The Great Gatsby (1926), by Herbert Brenon – a silent movie of a stage adaptation, starring Warner Baxter, Lois Wilson, and William Powell. It is a famous example of a lost film. Reviews suggest that it may have been the most faithful adaptation of the novel, but a trailer of the film at the National Archives is all that is known to exist. The Great Gatsby (1949), by Elliott Nugent – starring Alan Ladd, Betty Field, and Macdonald Carey; for copyright reasons, this film is not readily available. The Great Gatsby (1974), by Jack Clayton – starring Robert Redford, Mia Farrow, and Sam Waterston, with a script by Francis Ford Coppola. The Great Gatsby (2000), by Robert Markowitz – a made-for-TV movie starring Toby Stephens, Mira Sorvino, and Paul Rudd. G (2002), by Christopher Scott Cherot – a limited-release loose hip-hop adaptation set in the Hamptons starring Richard T. Jones, Chenoa Maxwell, and Andre Royo. The Great Gatsby (2013), by Baz Luhrmann – starring Leonardo DiCaprio, Carey Mulligan, and Tobey Maguire. Affluenza (2014), by Kevin Asch – a limited-release/video-on-demand adaptation set among Long Island teenagers in the midst of the 2008 economic recession, starring Gregg Sulkin, Nicola Peltz, and Ben Rosenfield. The Double Bind (2007) by Chris Bohjalian imagines the later years of Daisy and Tom Buchanan's marriage as a social worker in 2007 investigates the possibility that a deceased elderly homeless person is Daisy's son. Great (2014) by Sara Benincasa is a modern-day young adult fiction retelling of The Great Gatsby with a female Gatsby (Jacinta Trimalchio). The New York Metropolitan Opera commissioned John Harbison to compose an operatic treatment of the novel to commemorate the 25th anniversary of James Levine's debut. The work, called The Great Gatsby, premiered on December 20, 1999. On January 1, 1950, an hour-long adaptation was broadcast on CBS' Family Hour of Stars starring Kirk Douglas as Gatsby. In October 2008, the BBC World Service commissioned and broadcast an abridged 10-part reading of the story, read from the view of Nick Carraway by Trevor White. In May 2012, BBC Radio 4 broadcast The Great Gatsby, a Classic Serial dramatisation by Robert Forrest. The 1926 stage adaptation of Owen Davis, subsequently developed, became the 1926 film version. The play, directed by George Cukor, opened on Broadway on February 2, 1926 and ran for 112 performances. A successful tour later in the year included the performances Chicago, 1 August 20 through 2 October. In July 2006, Simon Levy's stage adaptation, the only one authorized and granted exclusive rights by the Fitzgerald Estate, had its world premiere at The Guthrie Theater to commemorate the opening of its new theatre, directed by David Esbjornson. It was subsequently produced by Seattle Repertory Theatre. In 2012, a revised/reworked version was produced at Arizona Theatre Company and Grand Theatre in London, Ontario, Canada. Gatz by Elevator Repair Service earned the #1 in the best in 2010 NYC theatre from The New York Times's Ben Brantley. An award-winning Off-Broadway production. On August 7, 2012, The Great Gatsby Musical opened at the Kings Head Theatre, London. A Ruby In The Dust production, it is adapted by Joe Evans and Linnie Reedman with music and lyrics by Joe Evans, directed by Linnie Reedman, with Matilda Sturridge as Daisy Buchanan. The show transferred to the Riverside Studios in 2013 with the music orchestrated by Chris Walker and musical staging by choreographer Lee Proud. In September 2015 it was announced that The Great Gatsby would be staged in London as the play Gatsby as a limited exclusive showcase production at the Arts Theatre. ↑ The spelling "Wolfshiem" appears throughout Fitzgerald's original manuscript, while "Wolfsheim" was introduced by an editor (Edmund Wilson) in the second edition and appears in later Scribner's editions. ↑ The original edition used the anatomically incorrect word "retinas", while some later editions have used the word "irises". ↑ Karolides, Nicholas J.; Bald, Margaret; Sova, Dawn B. (2011). 120 Banned Books: Censorship Histories of World Literature (Second ed.). Checkmark Books. p. 499. ISBN 978-0-8160-8232-2. Rather than a celebration of such decadence, the novel functions as a cautionary tale in which an unhappy fate is inevitable for the poor and striving individual, and the rich are allowed to continue without penalty their careless treatment of others' lives. ↑ Hoover, Bob (10 May 2013). "'The Great Gatsby' still challenges myth of American Dream". Pittsburgh Post-Gazette. Retrieved 10 May 2013. ↑ "Something Extraordinary". Letters of Note. Images by Gareth M. lettersofnote.com. 25 March 2013. Retrieved 24 May 2013. ↑ "100 Best Novels". Modern Library. Retrieved 14 May 2014. ↑ Gross, Dalton (1998). Understanding the Great Gatsby: A Student Casebook to Issues, Sources, and Historical Documents. Westport, Connecticut: Greenwood Press. p. 167. ↑ Kellogg, Carolyn. "Last gasp of the Gatsby house". Los Angeles Times. Retrieved 26 April 2013. 1 2 3 SparkNotes Editors. "The Great Gatsby: Context". SparkNotes. Retrieved 2013-11-25. ↑ Powers, Thomas (July 4, 2013). "The Road to West Egg". London Review of Books. 13. pp. 9–11. ↑ Sarah Churchwell (June 17, 2014). "Murder, Mayhem, and the Invention of The Great Gatsby". The Leonard Lopate Show. ↑ David Holowka (December 17, 2009). "The Iron Triangle, part 1 / Wilson's Garage". ArchiTakes. ↑ McCullen, Bonnie Shannon (2007). "This Tremendous Detail: The Oxford Stone in the House of Gatsby". In Assadi, Jamal; Freedman, William. A Distant Drummer: Foreign Perspectives on F. Scott Fitzgerald. New York: Peter Lang. ISBN 978-0820488516. ↑ Conor, Liz (22 June 2004). The Spectacular Modern Woman: Feminine Visibility in the 1920s. Indiana University Press. p. 301. ISBN 978-0-253-21670-0. ↑ Fitzgerald, F. Scott (1991). Bruccoli, Matthew J., ed. The Great Gatsby. The Cambridge Edition of the Works of F. Scott Fitzgerald. Cambridge: Cambridge Univ. Press. p. 184. ISBN 9780521402309. This name combines two automobile makes: the sporty Jordan and the conservative Baker electric. ↑ Fitzgerald, F. Scott (2006). Bloom, Harold, ed. The Great Gatsby. New York: Chelsea House Publishers. p. 95. ISBN 9781438114545. ↑ Fitzgerald, F. Scott (1997). Tredell, Nicolas, ed. F. Scott Fitzgerald: The Great Gatsby. Columbia Critical Guides. New York: Columbia University Press. p. 184. ISBN 9780231115353. ISSN 1559-3002. ↑ F. Scott Fitzgerald: The Great Gatsby. Cambridge University Press. 1991. p. liv. ↑ F. Scott Fitzgerald: The Great Gatsby. Cambridge University Press. 1991. p. 148. ↑ Curnutt, Kirk (2004). A Historical Guide to F. Scott Fitzgerald. Oxford University Press. p. 58. ISBN 0195153030. Retrieved 11 October 2013. The failure of The Vegetable in the fall of 1923 caused Fitzgerald, who was by then in considerable debt, to shut himself in a stuffy room over a garage in Great Neck, New York, and write himself out of the red by turning out ten short stories for the magazine market. 1 2 3 4 5 6 7 8 9 10 11 12 13 14 15 16 17 Mizener, Arthur (24 April 1960). "Gatsby, 35 Years Later". The New York Times. Retrieved 12 May 2013. ↑ Murphy, Mary Jo (30 September 2010). "Eyeing the Unreal Estate of Gatsby Esq.". The New York Times. ↑ Randall, Mónica (2003). The Mansions of Long Island's Gold Coast. Rizzoli. pp. 275–277. ISBN 978-0-8478-2649-0. ↑ West, James L. W., III (2000). Trimalchio: An Early Version of The Great Gatsby. The Cambridge Edition of the Works of F. Scott Fitzgerald. Cover Design by Dennis M. Arnold. Cambridge University Press. p. xi. ISBN 0-521-89047-0. Retrieved 27 July 2013. He produces 18,000 words; most of this material is later discarded, but he salvages the short story "Absolution," published in June 1924. ↑ Haglund, David (7 May 2013). "The Forgotten Childhood of Jay Gatsby". Slate. ↑ Flanagan, Thomas (21 December 2000). "Fitzgerald's 'Radiant World'". The New York Review of Books. Retrieved 24 May 2013. He may have been remembering Fitzgerald's words in that April letter: So in my new novel I'm thrown directly on purely creative work—not trashy imaginings as in my stories but the sustained imagination of a sincere yet radiant world. ↑ Leader, Zachary (21 September 2000). "Daisy packs her bags". London Review of Books. 22 (18): 13–15. ISSN 0260-9592. Retrieved 24 February 2013. ↑ Perkins, Maxwell Evarts (2004). Bruccoli, Matthew Joseph; Baughman, Judith S., eds. The Sons of Maxwell Perkins: Letters of F. Scott Fitzgerald, Ernest Hemingway, Thomas Wolfe, and Their Editor. Univ. of South Carolina Press. pp. 27–30. ISBN 9781570035487. ↑ Fitzerald, F. Scott. "F. Scott Fitzgerald's ledger". Irvin Department of Rare Books and Special Collections. University of South Carolina. Retrieved 29 April 2013. ↑ Zuckerman, Esther. "The Finances of F. Scott Fitzgerald, Handwritten by Fitzgerald". The Atlantic Wire. The Atlantic Media Company. Retrieved 29 April 2013. ↑ Hemingway, Ernest (1964). A Moveable Feast. New York: Scribner. p. 176. ISBN 978-0-684-82499-4. 1 2 3 4 5 Anderson, Kurt (25 November 2010). "American Icons: The Great Gatsby". Studio 360. 14:26. Retrieved 22 May 2013. [Donald Skemer (introduced 12:59) speaking] He went through many many titles, uh, including Under the Red, White, and Blue and Trimalchio and Gold-hatted Gatsby ... [James West (introduced at 12:11) speaking] The High Bouncing Lover. And, uh, he in the end didn't think that The Great Gatsby was a very good title, was dissatisfied with it. ↑ "The girl at the Grand Palais". The Economist. 22 December 2012. Retrieved 27 March 2013. ↑ Tanner's introduction to the Penguin edition (2000), p. vii–viii. ↑ Hill, W. Speed; Burns, Edward M.; Shillingsburg, Peter L. (2002). Text: An Interdisciplinary Annual of Textual Studies. 14. University of Michigan Press. ISBN 0472112724. ..., because in early November he wrote Perkins that "I have now decided to stick to the title I put on the book. Trimalchio in West Egg. ↑ Fitzgerald, Francis Scott; Perkins, Maxwell (1971). Kuehl, John; Bryer, Jackson R., eds. Dear Scott/Dear Max: the Fitzgerald-Perkins correspondence. Macmillan Publishing Company. p. 87. When Ring Lardner came in the other day I told him about your novel and he instantly balked at the title. 'No one could pronounce it,' he said; so probably your change is wise on other than typographical counts. ↑ Lipton, Gabrielle. "Where Is Jay Gatsby's Mansion?". slate.com. The Slate Group, a Division of the Washington Post Company. Retrieved 6 May 2013. However, nearing the time of publication, Fitzgerald, who despised the title The Great Gatsby and toiled for months to think of something else, wrote to Perkins that he had finally found one: Under the Red, White, and Blue. Unfortunately, it was too late to change. ↑ Churchwell, Sarah (3 May 2013). "What makes The Great Gatsby great?". The Guardian. Retrieved 11 October 2013. At the last minute, he had asked his editor if they could change the new novel's title to Under the Red, White and Blue, but it was too late. ↑ Lazo, Caroline Evensen (2003). F. Scott Fitzgerald: Voice of the Jazz Age. Twenty-First Century Books. p. 75. ISBN 0822500744. When the book was published on April 10, 1924, the critics raved. ↑ West, James L. W., III (2000). Trimalchio: An Early Version of The Great Gatsby. The Cambridge Edition of the Works of F. Scott Fitzgerald. Cover Design by Dennis M. Arnold. Cambridge University Press. ISBN 0-521-89047-0. Retrieved 27 July 2013. ↑ West, James L. W., III (10 April 2013). "What Baz Luhrmann Asked Me About The Great Gatsby". The Huffington Post. Retrieved 27 July 2013. Luhrmann was also interested in Trimalchio, the early version of The Great Gatsby that I published in 2000 as a volume in the Cambridge Edition. ↑ Fitzgerald, F. Scott. The Great Gatsby. New York: Scribner, 2004. Print. ↑ Churchwell, Sarah (3 May 2013). "What makes The Great Gatsby great?". The Guardian. Retrieved 11 October 2013. 1 2 Symkus, Ed (4 May 2013). "'Gatsby': What's so great?". Boston Globe. Retrieved 5 May 2013. 1 2 3 Gillespie, Nick (2 May 2013). "The Great Gatsby's Creative Destruction". Reason. Retrieved 12 May 2013. ↑ Pearson, Roger L. "Gatsby: False Prophet of the American Dream." The English Journal 59.5 (1970): n. pag. JSTOR. Web. 12 Apr. 2015. ↑ Leland, Person S. "'Herstory' and Daisy Buchanan." American Literature, Vol. 50, No. 2, (May, 1978), pp. 250-257. Web. 1 2 3 O'Meara, Lauraleigh (2002). Lost City: Fitzgerald's New York (1st paperback ed.). Routledge. ISBN 978-0-415-86701-6. Retrieved 21 May 2013. ↑ Clark, Edwin (19 April 1925). "Scott Fitzgerald Looks Into Middle Age". The New York Times. Retrieved 11 May 2013. ↑ Ford, Lillian C. (10 May 1925). "The Seamy Side of Society". Los Angeles Times. Retrieved 11 May 2013. ↑ "Books On Our Table". The New York Post. 5 May 1925. ↑ "Turns with a Bookworm". New York Herald Tribune. 12 April 1925. ↑ Mencken, H. L. (3 May 1925). "Scott Fitzgerald and His Work". The Chicago Daily Tribune. ↑ Eagleton, Harvey (10 May 1925). "Profits of the New Age III. F. Scott Fitzgerald". The Dallas Morning News. ↑ McClure, John (31 May 1925). "Literature-And Less". The Times-Picayune. ↑ Coghlan, Ralph (25 April 1925). "F. Scott Fitzgerald". St. Louis Post-Dispatch. ↑ Snyder, Ruth (15 April 1925). "A Minute or Two with Books-F. Scott Fitzgerald Ventures". New York Evening World. ↑ Howell, Peter (5 May 2013). "Five things you didn't know about The Great Gatsby". The Star. Retrieved 5 May 2013. 1 2 Donahue, Deirdre (7 May 2013). "The Great Gatsby by the numbers". USA Today. Retrieved 12 May 2013. ↑ "Scott Fitzgerald, Author, Dies at 44". New York Times. 23 December 1940. Retrieved 30 August 2010. The promise of his brilliant career was never fulfilled. ↑ Mizener, Arthur (24 April 1960). "Gatsby, 35 Years Later". The New York Times. Retrieved 12 May 2013. Writers like John O'Hara were showing its influence and younger men like Edward Newhouse and Budd Schulberg, who would presently be deeply affected by it, were discovering it. ↑ Wittels, David (23 June 1945). "What the G.I. Reads". The Saturday Evening Post. ↑ Cole, John Y., ed. (1984). Books in Action: the Armed Services Editions. Washington: Library of Congress. p. 28. ISBN 0844404667. Retrieved 22 May 2013. One hundred fifty-five thousand ASE copies of The Great Gatsby were distributed-as against the twenty-five thousand copies of the novel printed by Scribners between 1925 and 1942. ↑ Beckwith, Ryan Teague (12 May 2013). "A novel fact: Wartime - and the U.S. military - boosted sales of 'The Great Gatsby' from good to 'Great'". The Denver Post. Retrieved 22 May 2013. ↑ Verghis, Sharon (4 May 2013). "Careless people of F Scott Fitzgerald's Great Gatsby have a modern equivalent". The Australian. Retrieved 5 May 2013. ↑ Grossberg, Michael (20 April 2009). "Literary classic 'Great Gatsby' to come to life on BalletMet stage". The Columbus Dispatch. Retrieved 28 August 2016. ↑ "The Washington Ballet: The Great Gatsby". Kennedy Center. Retrieved 2014-04-01. ↑ Aguirre, Abby (2011-11-04). "Gatsby En Pointe". The New York Times. Retrieved 2014-04-01. ↑ Norman, Neil (2013-05-17). "Dance Review: The Great Gatsby". The Sunday Express. Retrieved 2014-09-19. ↑ "The Great Gatsby's Ballet Makeover". Vogue. 2013-03-07. Retrieved 2014-09-19. ↑ Paskin, Willa (15 July 2010). "The Great Gatsby, Now a Video Game – Vulture". Nymag.com. Retrieved 30 August 2010. ↑ "Classic Adventures: The Great Gatsby for iPhone/iPad Reviews". Metacritic. 2012-12-08. Retrieved 2013-11-25. ↑ Bell, Melissa (15 February 2011). "Great Gatsby 'Nintendo' game released online". The Washington Post. Retrieved 15 February 2011. ↑ Crouch, Ian (16 February 2011). "Nintendo Lit: Gatsby and Tom Sawyer". The New Yorker. Retrieved 24 February 2013. 1 2 3 Dixon, Wheeler Winston (2003). "The Three Film Versions of The Great Gatsby: A Vision Deferred". Literature/Film Quarterly. Salisbury, Maryland. 31 (4). Retrieved 11 October 2013. ↑ Goldberg, Carole (18 March 2007). "The Double Bind By Chris Bohjalian". Houston Chronicle. Retrieved 22 May 2013. ↑ Wakeman, Jessica (8 April 2014). "FRISKY Q&A: GREAT AUTHOR SARA BENINCASA TALKS YOUNG ADULT FICTION, ZELDA FITZGERALD & WOMEN IN COMEDY". Retrieved 29 November 2014. ↑ Stevens, David (29 December 1999). "Harbison Mixes Up A Great 'Gatsby'". The New York Times. Retrieved 8 April 2011. ↑ "Family Hour Of Stars". radioechoes.com. ↑ "BBC World Service programmes – The Great Gatsby". Bbc.co.uk. 2007-12-10. Retrieved 30 August 2010. ↑ "BBC Radio 4 - Classic Serial, The Great Gatsby, Episode 1". Bbc.co.uk. 2012-05-12. Retrieved 2013-11-25. ↑ The Great Gatsby – A Reader's Guide – The Play (1926). 1 2 Levy, Simon. "The Great Gatsby Play Official Website". Thegreatgatsbyplay.com. Retrieved 2013-11-25. ↑ "Arizona Theatre Company". Arizonatheatre.org. Retrieved 2013-11-25. ↑ Brantley, Ben (2010-12-16). "Hath Not a Year Highlights? Even This One?". The New York Times. Retrieved 2014-04-01. ↑ Porteous, Jacob (September 29, 2015). "Kim Medcalf, Matilda Sturridge And Ellie Nunn Star In Gatsby At The Arts Theatre". Retrieved September 29, 2015. Batchelor, Bob (2013). Gatsby: The Cultural History of the Great American Novel. Lanham, Maryland: Rowman & Littlefield Publishers. ISBN 978-0810891951. Retrieved 15 July 2014. Bruccoli, Matthew Joseph, ed. (2000). F. Scott Fitzgerald's The Great Gatsby: A Literary Reference. New York: Carroll & Graf Publishers. ISBN 0-7867-0996-0. Bruccoli, Matthew Joseph (2002). Some Sort of Epic Grandeur: The Life of F. Scott Fitzgerald (2nd rev. ed.). Columbia, SC: University of South Carolina Press. ISBN 1-57003-455-9. Retrieved 25 February 2013. Mizener, Arthur (1951). "The Far Side of Paradise: A Biography of F. Scott Fitzgerald". Boston: Houghton Mifflin Harcourt. Drudzina, Douglas (2006). Teaching F. Scott Fitzgerald's The Great Gatsby from Multiple Critical Perspectives. Prestwick House, Inc. ISBN 978-1-58049-174-7. Fitzgerald, F. Scott. The Great Gatsby (plain text ed.). Project Gutenberg Australia. "In Gatsby's Tracks – Locating the Valley of Ashes". litkicks.com. Conversations from Penn State: Writers of the Lost Generation with Linda Patterson Miller discussing F. Scott Fitzgerald and his relationships with other writers of the "Lost Generation"
Oloizia, Jeff; Dhanraj, Emanuel (9 April 2013). "A Book by Its Covers" (interactive photo gallery). T: The New York Times Style Magazine.